It has been over a year since the installation of my outdoor ground mounted AM transmitter and, until today, there have been no problems when it was discovered that the transmitter was off the air…not a weak signal but no signal at all. The transmitter was brought to the 8Z labs and the problem was obvious when the lid on the enclosure was opened revealing about a quarter of an inch of water in the bottom of this water proof box. The water could have entered where the RF and power/audio lines enter but the duct seal compound at these points was intact. Water could have entered through the power cable which is a simple vinyl covered multi-conductor cable where the water can creep through the cable between the outer jacket and the conductors but there was no evidence of this. The water could have entered if the cover gasket was not seated and, indeed, inspection of this gasket revealed that it had some gaps where it was not smooth. Though not definitely determined, this is the most likely path for the water entry. The water did not damage anything but it did affect the PLL frequency generator most likely by entering the DIP frequency selector switch. The PLL frequency was 8.9 kHz rather than the usual operating frequency which could have been caused by water in the switch bridging the contacts which were supposed to be open. A few minutes of gentle application of a heat gun fixed the problem. The next step will be to place a plastic bucket over the enclosure to make it harder for water to enter, or even better still, maybe install a mini sump pump in the box. That got your attention didn’t it? Now notice the power is 1/2 MW and not 1/2 mW. MW is megawatt and the station is the former WLW 500,000 Watt “Nation’s Station”. 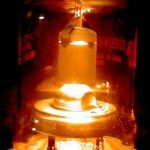 There are many on line historical stories about this station but here is one which I had not seen before and it is a fairly interesting read, especially since it was published while the station was still operating at 500,000 Watts. It details some of the technical aspects of the station as well as other information about studios, etc. I found this at the Nostalgia Air website which is nice to visit if you are interested in old time radio equipment. I used to drive by the transmitter site every work day going to and from work. The main tower is still there and is still in service as is the transmitter building and the “engineer’s home”. The cooling pond is also there but it is not used. There were reports of the station’s audio coming from fences and teeth fillings so perhaps these and other factors resulted in the station’s power being reduced to 50 kW which is it’s current power. Hope you enjoy the piece of history. My station uses an outdoor AM transmitter which has a “control point” provided by a simple box with two switches and a LED. The box transfers DC power to the outdoor transmitter from the wall wart source by means of one switch and the LED indicates power on. The other switch is an audio mute switch. The original oscillator in this transmitter used a rather poor grade crystal so it was necessary to use a crystal oven to keep in on frequency as the temperature changed. I wanted some indication of the heater cycling so I connected an analog DC milliammeter in series with the transmitter power lead at the control box. With this I could tell the duty cycle of the heater and monitor it for correct operation. The crystal oscillator has been replaced with a PLL and the heater is no longer used but I left the meter in the circuit to indicate the total current going to the transmitter. Some time ago (years perhaps) someone, I believe it was Carl Blare, posted the idea of building a metering panel to connect to transmitters. The proposed parameters to meter were more than just the gross current but I am limited to this because there are only three conductors going to the transmitter (power, audio, and ground). Over time I have grown accustomed to glancing at the meter and noting the current is 107 mA. But yesterday I noticed the pointer wasn’t where it usually is and was indicating a current of 95 mA. The signal sounded fine but something had changed. The change was that the measured field strength was down due to snow on the loading coil. It turns out that there is a slight but definite relationship between this current and the field strength due to the decreased power output into the antenna system as it was detuned by the snow. Today, the snow is gone, the current is back to 107 mA, and the signal strength is normal. Monitoring the transmitter total DC input current can be a simple way to tell if something has changed even if what has changed is not immediately known. This current reading will alert to many problems which could develop. If for no other purpose the meter indicates the power is on so maybe I don’t need the LED anymore, but it looks nice so I’ll keep it. Total Harmonic Distortion is a measure of non-linearity in an audio system and is calculated as the RMS voltage of all the harmonics divided by the test tone RMS voltage multiplied by 100%.. The THD of my AM transmitter over the air signal as received by two receivers was measured. The test tone was an 800 Hz sine applied uncompressed to the previously describe “high efficiency” transmitter and the first receiver was a BC-1004-C with the IF bandwidth set to 10 kHz. The transmitter modulation and receiver AVC and audio volume were set to yield the minimum THD. The received audio signal THD measured 0.72%. A second receiver, a Yaesu FRG-100, was similarly adjusted and the audio THD measured was 1.04%. The results for the two receivers may not be comparable because the FRG-100 has a narrower bandwidth than the BC-1004-C which would tend to reduce the THD reading for the FRG-100 since some higher harmonics are attenuated. Nonetheless, a THD around 1% for the total chain is not too bad. I have previously reported a listenable range on a truck radio for my ground mounted AM system system as being 1 mile with fading at 1.3 miles. Today, while on an errand, I checked range again and it was solid listenable out to 1.8 miles on my truck radio and could be heard with flutter and noise 2.3 miles away (that’s as far away that I drove). Though this is impressive for a part 15 AM system the actual range for in home listeners is not known but it is most probably much less. Someone with a good receiver and an outdoor antenna could probably receive the signal at two miles plus. What has changed? Since my previous check we have had quite a bit of rain and the ground is moist but the field strength checked with my monitoring system hasn’t changed. The other change is that I was previously using a modified Ramsey AM-25 but am now using my “high efficiency” transmitter which delivers 86 mW to the antenna system with 100 mW DC in. This doesn’t explain the change in range however since the modified AM-25 delivers about the same power to the antenna system. The other encouraging observation is that I have not tuned the antenna system in over a month and the field strength remains the usual so it appears to be stable. Much of this information is posted around this site but here it is presented in one place. 3dB is double the power and 10 dB is 10 times the power. 6dB is double the voltage and 20 dB is 10 times the voltage. The best way to understand what follows is to use a scientific calculator (one which does Logs and exponents of 10) and work the examples presented. As with many things, this can be hard at first but it gets easier with practice. A fundamental to remember is that the decibel is always a ratio which makes dB convenient when comparing two measurements. For example if a voltage increases from 2 to 8 volts this increase is 20log(v1/v2) = 20log(8/2) = 12dB. If the voltage decreases then the dB is negative. Decibels are also used to compare voltages at different parts of a circuit. For example, if the input to an amplifier is 0.7 Volts and the output is 15 Volts then the gain (recall that dB is a ratio) G = 20Log(15/0.7) = 26.6 dB. There is a “trick” which can be used to express a voltage in dB as an absolute but in fact it is still a ratio. For example, dBuV is often used to express the strength of an electric field with the understanding that the reference voltage is 1 microvolt (uV). A field strength of 250 uV/m can be expressed as FS = 20log(250uV/1uV) = 47.96 dBuV. A dBuV reading can be converted to Volts by using V = (1uV)10^(dBuV/20) which is for this example V = (1uV)10^(47.96dBuV/20) = 250 uV. (Try this by rounding 47.96dBuV up to 50dBuV and you will see how the log scale is not intuitive). Of interest ot part 15 hobbyists is range so how are dBuV measurements used for this? Suppose we use a receiver which displays the received signal strength in dBuV and make a measurement of signal strength 200 feet from the transmit antenna and it is 55 dBuV. With tuning the signal increases to 60 dBuV. This doesn’t seem like much improvement but since dBs are logarithmic it actually is. Calculating: V = (1uV)10^(55dBuV/20) = 562 uV. After tuning V = (1uV)10^(60dBuV/20) = 1000 uV and since range is approximately proportional to field strength in the far field the increase in range here is 1000/562 = 1.78 or 78%. It is not necessary to calculate both voltages to get to the range change. Here is a shortcut: take the difference in dBuV (60dBuV – 55 dBuV = 5 dB) and calculate range increase = 10^(5dB/20) = 1.78 or 78%. You might wonder what happened to dBuV when the two readings were subtracted. Subtracting dB is the same as dividing volts so the 1 uV reference cancels leaving only a ratio expressed in dB. At the transmitter, dBm can be used in a similar manner if the transmitter power delivered to the antenna can be measured. Lacking this, the output power ratios can be approximated by using the DC input power to the final stage. Take an example where the input power is increased from 75 to 100 mW and calculate the expected range increase. This increase is 10Log(100mW/75mW) = 1.25 dB. The increase in range using the equation from above is = 10^(1.25/20) = 1.15 or 15%. (This can also be done by calculating the range increase = SQRT(P2/P1) = SQRT(100mW/75mW) = 1.15 or 15%). You might wonder why the factor 10 was used to calculate the increase in dB yet the factor 20 was used to calculate the range increase. This is because 10 is used with dB calculations of power and 20 is used with dB calculations of voltage and the range change uses voltage. There is a bit more about dB calculations which has been omitted here to focus on what is usable for Part15 calculations but in general it is good to understand that the dB is a logarithmic unit and a seemingly small change in dB represents a larger change in voltage, power, or range. For example a signal strength of 96 dBu is double that of 90 dBu yet they appear to be about the same. dB is always a ratio. dBuV and dBm are ratios to 1 uV and 1mW respectively. Use the factor 10 when calculating with power and 20 when calculating with voltage. 3dB is double the power and 6 dB is double the voltage. Using dB can be daunting at first but if you are willing to work through the examples given using a scientific calculator and follow the meaning of the calculations then the quick reference given at the beginning of this article can become a “pocket reference”.